Looking for an easy, bite-sized breakfast for your busy fall mornings? Look no further! 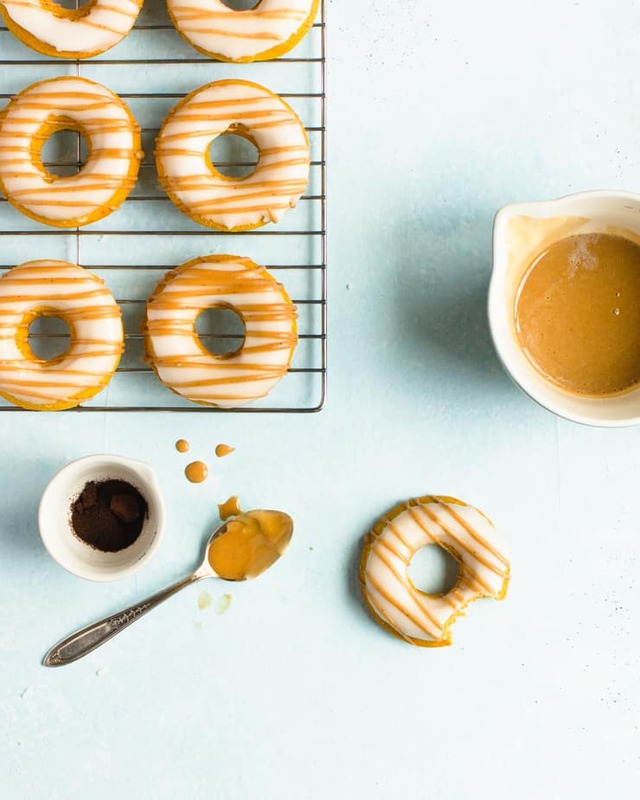 These pumpkin spice latte doughnuts are sure to get your day off to a sweet start. It has officially started feeling like fall here in the Pacific Northwest… The days are getting noticeably shorter, the mornings are cool enough to require a jacket and the skies seem to be more clouds and rain than anything else these days. I say, bring it on! I am SO ready to break out the sweaters, cozy boots and stock my pantry to the brim with all things pumpkin. 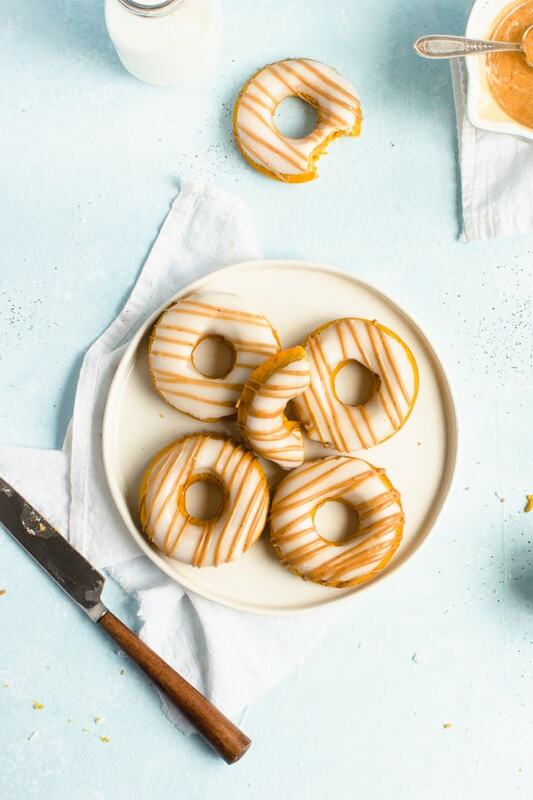 ESPECIALLY these pumpkin spice latte doughnuts! 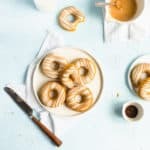 If you’re not a morning person, good news: These doughnuts are SO easy to make! And they don’t even require fancy kitchen equipment. Just a whisk and some good ol’ fashion elbow grease. First, combine the dry ingredients in one bowl, wet ingredients in another, and then whisk together. Pour your batter into a greased doughnut pan and bake for 8-10 minutes. Second, whisk your glaze ingredients together in a small saucepan over low heat until the glaze begins to form a crust. Whisk to break up the glaze and then start dippin’! 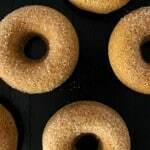 Third, whisk your espresso powder and a little extra water into the remaining glaze and drizzle it over your doughnuts. Never made these doughnuts before? No worries! Here are some tricks and tips to help you make the perfect batch the first time around. Dip each doughnut into the glaze, gently shaking it to allow any excess glaze to drip off. Be sure to stir the glaze between each doughnut so it doesn’t form a crust. Once all of the doughnuts are glazed, add the espresso powder and 2 tsp of water to the remaining glaze. Stir the glaze until all of the espresso powder has dissolved. 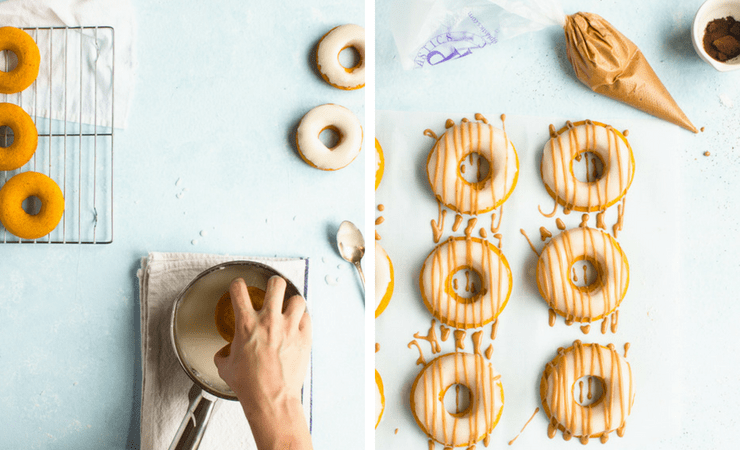 Pour the espresso glaze into a piping bag, cut the tip, and drizzle over the doughnuts (preferably with a piece of parchment paper under them). Use a piping bag to pipe your doughnuts into your doughnut pan. This is a lot easier and less messy than trying to pour from the bowl. Be sure not to over-bake the doughnuts. Over-baked doughnuts tend to be dry and hard. To bake the perfect doughnuts, I recommend checking them at the 7-8 minute mark. If they’re still uncooked inside, pop them in for another minute. Repeat each minute until baked all the way through. Be sure not to over-cook the glaze. Over-cooked glaze losing too much liquid and becomes hard. The best way to make sure your glaze doesn’t get over-cooked is to cook it over low heat and remove it once it starts forming a crust. If your glaze becomes over-cooked, simply add more water in 1/2 tsp increments until the glaze breaks up enough to use. 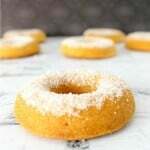 Reviving stale doughnuts: If you wound up with leftovers and they’ve gotten stale, no worries! You can soften them back up by microwaving them in 5-10 second increments until soft. Just watch out for melting frosting. Update Notes: This post was originally published in September of 2014 but was republished with step by step photos and tips in September of 2018. Oh my gosh these sound awesome! I love pumpkin, pumpkin, pumpkin, and I know I will love, love, love these 🙂 I’m going gluten free for a couple of weeks, except for my birthday, which is next week. I think my birthday calls for pumpkin doughnuts. Popping in from Say G’day to check out your fabulous recipe. 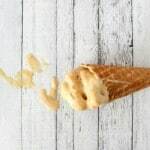 I would be honored if you would come by and share your recipe at Foodie Friday’s too! It looks amazing. Hope to see you there. Pure deliciousness!! Bring on the pumpkin! Pumpkin spice anything is good with me! I really need to try making doughnuts myself. Now these certainly sound like the perfect fall breakfast! Pumpkin spice latte combined with doughnuts? Absolutely delicious! I’m a pumpkin lover so definitely need to test these out! These are absolutely beautiful! I love that the doughnuts are baked too, making them a little healthier. I’ll try these soon! First off, love the photos. Second off, LOVE PSL! Third, love that you cooked the icing. Fantastic recipe, I can’t wait to try this out! 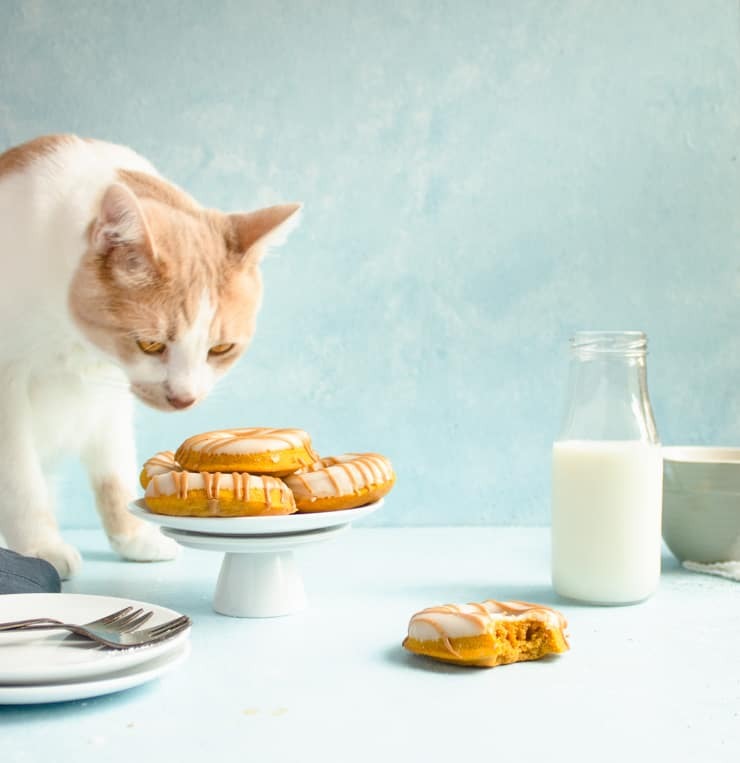 YES, YES, YES…pumpkin donuts. I was just saying to my husband I need to make some pumpkin donuts. I know my grandson will LOVE me to the moon and back when I bake some for him!! Printing it off right now!! I can’t blame Odie for trying to run off with a doughnut, they look really tasty. I love the flavors of pumpkin spice during the fall months and this looks like the perfect way to enjoy them! 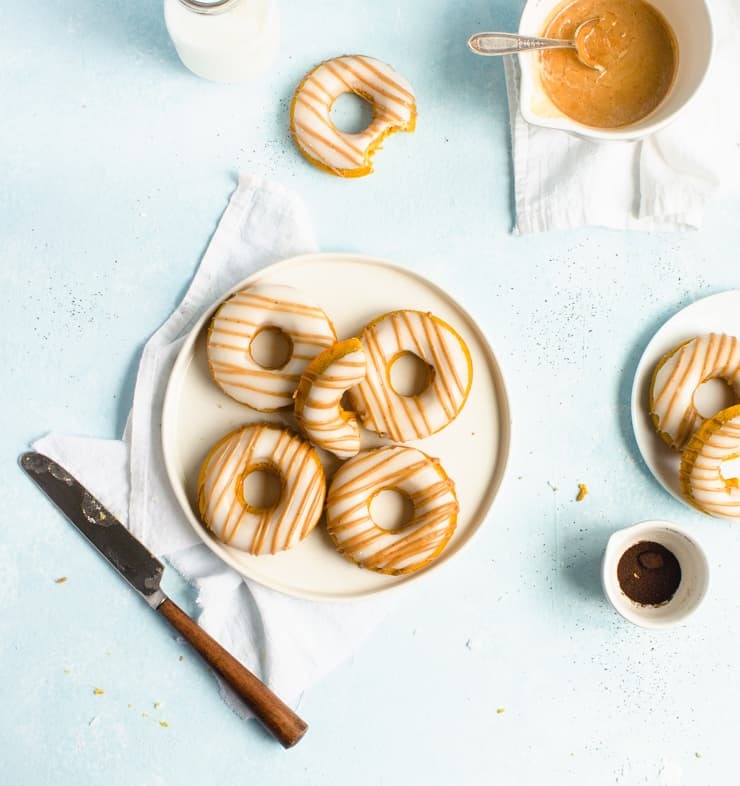 I’m all about those pumpkin spice lattes….pumpkin spice anything really…so these doughnuts are right up my alley. Maybe one of these dunked in a latte? YUM! Okay, this is the perfect donut! I love pumpkin and the spices you used. And don’t get me started on the glaze because this comment would be way too long. I can’t wait to make your delicious pumpkin spice donuts! Wow I love how you took all those flavours and put them into a doughnut. They look incredible and your photos are stunning! Great work Claire!! Keep it up. What a great way to start the Fall season — with pumpkin donuts!! I can smell the aroma now — certainly making my mouth water as I sip on my coffee!! I’ve got to get one of those pans — they make perfect donuts. I’m pinning right now. How perfect are these donuts. Perfect fall treat. I am loving pumpkin recipes and this is so simple and so delicious! This is the PERFECT excuse to break out my donut pan! These look absolutely perfect for fall, and that drizzle looks SO delicious. Great for a fall treat! Love this post! Such pretty, petty photos (and OMG all the Odie cuteness! ), and really great tips about things like piping the doughnuts and why you cook the glaze – so helpful! Plus … just so much yumminess that’s much healthier since it’s baked instead of fried! Total win! Homemade doughnuts are one of my favorite item to make. 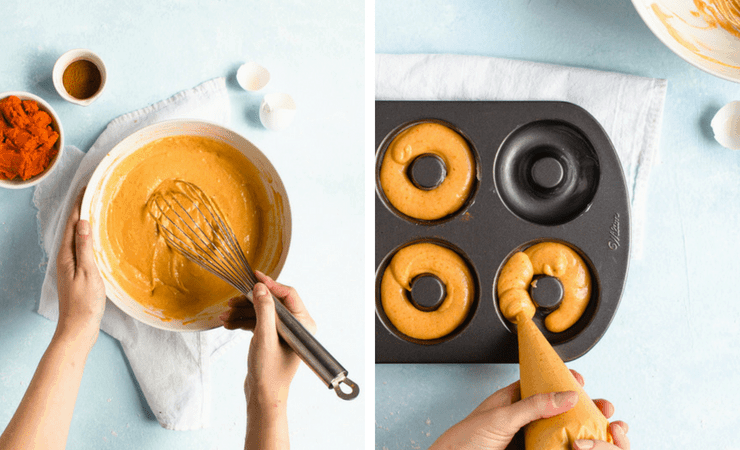 Making these pumpkin donuts with a special glaze, even better! Those look delicious! I love using pumpkin in baked goods – it keeps them beautifully moist,and tastes so good! 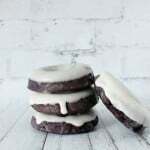 You had me at latte doughnuts! I want to try this soon! Bring on the pumpkin spice! I’m more than ready for these donuts! Ooooooo yes please!! I am PSL everything, all year not just during the Fall (ha!!). I love that they are baked too, and that glaze sounds heavenly!